Anne Holliday is the founder and Managing Director of the Amadeus Group having moved into the performing arts sector over 25 years ago after identifying an opportunity to develop products and provide the right solutions for musicians in professional and educational environments. Anne’s business career began in the City working for the CEO of a large corporation. Her responsibilities in the role increased rapidly and included personnel management, contractual management, sales, marketing projects, PR and she gained extensive experience on the trading floor. This training ground provided her with great insight into how to run a highly successful company. As Director of Amadeus Acoustic Solutions, John’s fascination for sound management can be traced as far back to his school days where he remembers struggling to understand his teachers in a noisy classroom environment. It would be some years later that he would discover the concept of reverberation times, intelligibility and the Lombard effect. Having already established a solid reputation in the education sector and becoming ever more cognisant of the part acoustics play within the classroom, Amadeus Acoustic Solutions was set up in July 1999 with John at the helm bringing an extensive CV of high profile, highly successful marketing and finance directorship. Since the inception, John has expanded the business segment exponentially assisting many market sectors beyond education and providing a wide range of acoustic products and services. As a designer, CAD specialist and experienced music equipment salesman Lorenzo has brought a range of skills to Amadeus since his recruitment in 2015 as the company’s Technical Sales and Design Consultant. He is now responsible for Performance Equipment sales and the design and development of new and existing products. 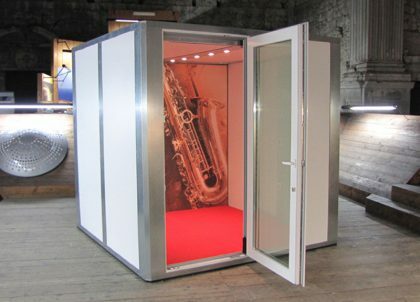 Lorenzo specialises in instrument storage solutions: marketing the company’s range of storage solutions, conducting storage requirement surveys and designing units, and was instrumental in the recent development and roll out of the company’s new design of dual layer acoustic shields. Lorenzo thinks outside the box and his desk is often buried under pieces of paper covered in various concept sketches, notes and doodles outlining product ideas. Claire-Marie joined Amadeus in January 2016, bringing over 25 years' experience in sales, marketing, promotion and customer service. Claire-Marie's exemplary skills in customer care come from a diverse career spanning tourism, events, and insurance industries, as well as experience in the public sector working for local council services. She is no stranger to meeting high sales targets, providing effective product promotion, delivering engaging presentations and tutoring in subjects from skiing to numeracy. As the Sales Executive for Amadeus Performance Equipment, Claire-Marie is dedicated to providing the best possible sales service and customer experience to our clients. As a consummate 'people person' and fellow musician, Claire-Marie loves to talk to our clients and believes in dedicating time to getting to know them, understanding their requirements fully, and sourcing the best value solution to meet their needs. Francisco's professional activity led him to specialise increasingly in the management of complex multi-cultural projects and their teams at international level. He has experience in strategic forward-planning, operating within the tight financial disciplines imposed by ambitious budgets and the application of modern leadership methods (through staff motivation and involvement in both decision-making and target-setting, clarity in communication, and easy personal inter-relations). Having being part of the founders team which created the Oporto Symphony Orchestra (Orquestra Sinfónica do Porto da Casa da Música), Francisco worked as Concerts Manager at the Royal Scottish National Orchestra (Glasgow) and was later the general co-ordinator of the Casa da Música Concert Hall project, while being the production co-ordinator of all musical events of Porto 2001, European Cultural City. His life path in the arts, and particularly in musical performances in Portugal and abroad, place him in a privileged position in negotiations that require the reconciliation of the cultural perspective, with the practical and functional aspects of the organisation of cultural events and musical performances. Adrian James is a Fellow of the Institute of Acoustics and a past Chairman of the Association of Noise Consultants. James graduated from Imperial College, London in 1984 with an Honours degree in Physics. He then spent two years in contract research into fluid flow dynamics and active noise control, and a further eight years gaining consultancy experience in large acoustics consultancies in London. In that time he was responsible for acoustic aspects of over 150 projects including BBC White City, Edinburgh International Conference Centre, and several concert halls and theatres in England, Ireland and Hong Kong. He also led acoustic studies for the refurbishments of the Royal Albert Hall, Royal Festival Hall and Royal Opera House in London. In 1994 he established Adrian James Acoustics, an independent consultancy specialising in the acoustic design of buildings for the performing arts and education. The practice has since expanded into other areas of acoustics and noise control, and has undertaken more than a thousand commissions of all sizes in the UK, mainland Europe and the Middle East. He was a principal author of the DfES Building Bulletin 93 "Acoustics of Schools" and continues to advise government departments and several county councils on the acoustics of buildings for education. Adrian has chaired a number of technical committees and working groups on acoustic measurements, and has published and presented papers in English and French on a wide range of acoustic subjects. He is a Fellow of the Institute of Acoustics and a past Chairman of the Association of Noise Consultants.